IBF/WBA light heavyweight champion Bernard Hopkins (55-6-2, 32 KOs) might be nearing 50-years-old and losing punching power, but he still feels he’s at a higher level than his opponent WBO light heavyweight champion Sergey Kovalev (25-0-1, 23 KOs) who he’ll be facing on November 8th on HBO Championship Boxing at the Boardwalk Hall in Atlantic City, New Jersey. Hopkins thinks he’s going to take the hard hitting Russian Kovalev to school next month and show him the difference between the levels he fights at and the one Kovalev has been fighting at during his career. This is a fight that is really difficult to predict a winner, because both guys have advantages and huge flaws in their game. Kovalev is slow and he lacks experience. His stamina is also a major question mark that will likely be answered on November 8th against Hopkins. But with the kind of power that Kovalev has, he can just as easily make up for his lack of experience and hand speed. If Kovalev can put hands on Hopkins for 8 rounds, he could very well beat up the old warrior to the point where it won’t be much of a fight for the last four rounds. Hopkins has the shoulder roll, but he doesn’t seem capable of fighting at a fast pace anymore. The Hopkins that defeated Kelly Pavlik no longer exists. He’s aged since then, and he fights at a much more economical pace, and he doesn’t move as well. 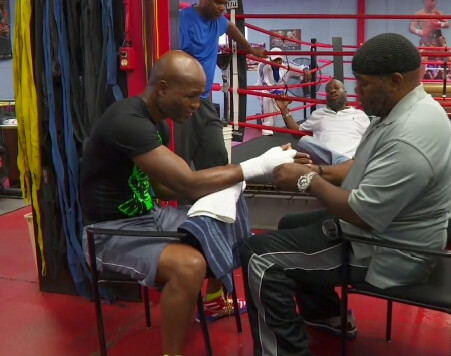 Hopkins has a lot of tricks he can use to nullify Kovalev’s power in this fight. You can expect Hopkins to hold a lot, move in circles and lean backwards to avoid getting hit with head shots. Kovalev will likely be looking to go to Hopkins’ body with some big shots, and that in turn could open up Hopkins’ head as he drops his guard.